"The story of a boy and a girl... and a black hole that reverses Earth's gravity"
Welcome to Earth. Every day, when the sun comes up, the Hole comes up as well- a massive, scientifically impossible black hole that reverses the gravity of Earth. Mankind has been decimated on the first day the Hole appeared. A boy and a girl wander through the wilderness of this new Earth, searching for the girl's brother- a man who disappeared into the Hole. The World Falls Up has not been reviewed yet. 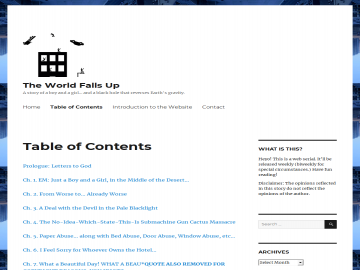 The World Falls Up has not been recommended yet.